Reading and share top 10 famous quotes and sayings about Water Flows by famous authors and people. 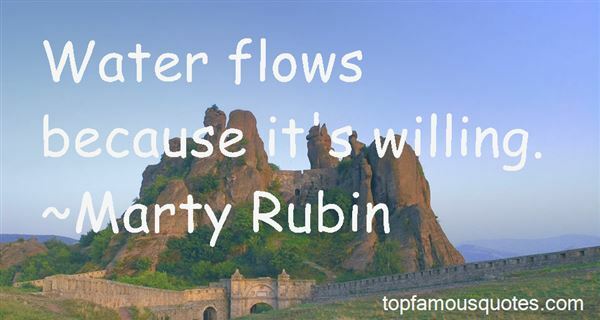 Browse top 10 famous quotes and sayings about Water Flows by most favorite authors. 1. "In a sense one should not go to books for ideas; the business of books is to make one think. We are not gramophone records, we are to think originally. What we preach is to be the result of our own thought. We do not merely transmit ideas. The preacher is not meant to be a mere channel through which water flows; he is to be more like a well. So the function of reading is to stimulate us in general, to stimulate us to think, to think for ourselves. Take all you read and masticate it thoroughly. Do not just repeat it as you have received it; deliver it in your own way, let it emerge as a part of yourself, with your stamp upon it." 2. "Math is like water. It has a lot of difficult theories, of course, but its basic logic is very simple. Just as water flows from high to low over the shortest possible distance, figures can only flow in one direction. You just have to keep your eye on them for the route to reveal itself. That's all it takes. You don't have to do a thing. Just concentrate your attention and keep your eyes open, and the figures make everything clear to you. In this whole, wide world, the only thing that treats me so kindly is math." 3. "You ask why I make my home in the mountain forest,and I smile, and am silent,and even my soul remains quiet:it lives in the other worldwhich no one owns.The peach trees blossom,The water flows." 4. "Water flows, but never changes. It's always H2O." 5. "Water does not resist. Water flows. When you plunge your hand into it, all you feel is a caress. Water is not a solid wall, it will not stop you. But water always goes where it wants to go, and nothing in the end can stand against it. Water is patient. Dripping water wears away a stone. Remember that, my child. Remember you are half water. If you can't go through an obstacle, go around it. Water does." 6. "Water flows because it's willing." 7. 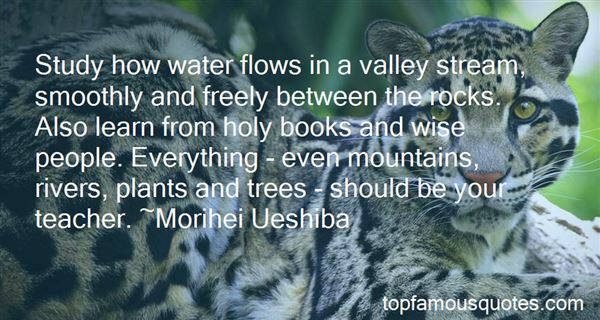 "Study how water flows in a valley stream, smoothly and freely between the rocks. Also learn from holy books and wise people. Everything - even mountains, rivers, plants and trees - should be your teacher." 8. "Wherever snow falls, or water flows, or birds fly, wherever day and night meet in twilight, wherever the blue heaven is hung by clouds, or sown with stars, wherever are forms with transparent boundaries, wherever are outlets into celestial space, wherever is danger, and awe, and love, there is Beauty, plenteous as rain, shed for thee, and though thou shouldest walk the world over, thou shalt not be able to find a condition inopportune or ignoble." 9. 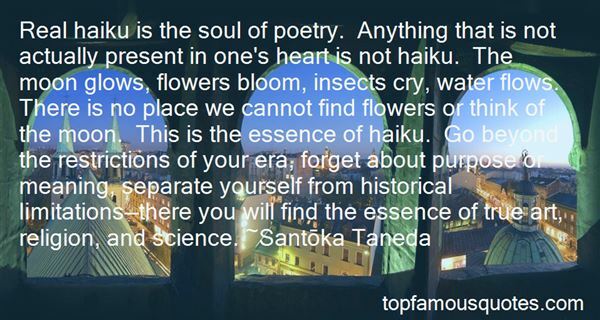 "Real haiku is the soul of poetry. Anything that is not actually present in one's heart is not haiku. The moon glows, flowers bloom, insects cry, water flows. There is no place we cannot find flowers or think of the moon. This is the essence of haiku. Go beyond the restrictions of your era, forget about purpose or meaning, separate yourself from historical limitations—there you will find the essence of true art, religion, and science." 10. "A liberal is a person who believes that water can be made to run uphill. A conservative is someone who believes everybody should pay for his water. I'm somewhere in between: I believe water should be free, but that water flows downhill." I think that Peter Jennings is the only decent one of the big three."